December 13, 2016 Join the discussion! Customer success is a relatively new field for B2B SaaS companies, but one that is critical to company growth, especially in the Age of the Customer. As it has become integral to a company’s own success, the responsibilities of the customer success team have changed significantly exposing new opportunities for customer growth beyond what has traditionally been possible from sales and marketing alone. CS teams are now tasked with driving revenue throughout the four stages of the customer journey – adoption, retention, expansion, and advocacy – but they struggle to scale quickly and effectively, develop proactive processes, and deliver value at each stage. 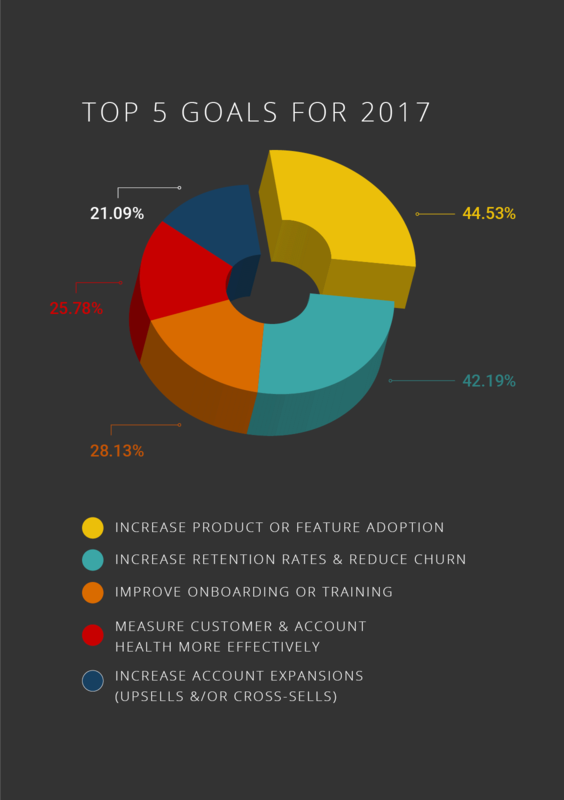 In UserIQ’s first annual State of Customer Success and Trends for 2017 survey, we uncovered a wealth of valuable information and feedback from customer success leaders across small and large B2B SaaS organizations in a variety of industries. In the report, we discovered five key trends that we expect to lead a major change for customer success in 2017, a year that promises to be a transition point as customer success builds proactive processes to phase out their traditionally reactive roles, allowing them to scale effectively while still delivering value with the personal touch customers expect. Trend 1: Cross-department alignment (especially with marketing and sales teams) will be key to improving product adoption and the overall customer journey. Four out of five survey respondents indicated that “increasing product adoption” and “improving onboarding” were their most significant priorities in the coming year, but this will prove challenging if handoffs from sales and marketing to customer success aren’t improved. Only 21% of companies surveyed say that their marketing, sales, and customer success teams are closely aligned, but 61% indicate that aligning their customer success team with marketing and sales is a main priority for 2017. Alignment between these three departments will smooth the initial steps after a buyer becomes a customer and will set the stage for a better long-term customer experience. But customer success isn’t the only department that benefits from this repositioning; by teaming up with customer success, sales and marketing can gain better insight into their most successful customers which will allow them to target better-fit customers in the future. Trend 2: Better user intelligence will be important in the coming year as teams aim to understand customer health, minimize churn and develop more proactive initiatives. Customer success teams’ second highest priority is more directly revenue related: reduce customer churn (42% of respondents ranked it as their top priority and an equal number considered it a high priority for 2017). And that makes sense; a leading KPI for most customer success departments is churn rate. However, keeping churn rates low requires better visibility into customer health and user intelligence data. In fact, nearly 40% of customer success teams today say that gaining visibility into customer health metrics and user behaviors is the number one challenge to their overall strategy, but less than 20% intend to give top level priority to fixing these visibility issues for the coming year. This suggests either a troubling degree of complacency with current levels of visibility into customer data or a lack of ideas on how to improve intelligence gathering. Trend 3: Retention and expansion initiatives will be largely dependent on whether or not CS teams can scale effectively using better technologies and developing smarter processes rather than increasing headcount. Since many teams are small and the workload far from light, technology seems like an obvious choice for filling gaps and facilitating and scaling customer growth initiatives. There’s just one big problem: more than 50% of customer success teams are using multiple technologies – most often CRM, email clients, spreadsheets and Helpdesk – on a daily and weekly basis despite already feeling overburdened by their workloads. And even with these tools, customer journey shortcomings and a lack of actionable user intelligence persists. This tells us that customer success needs better tools; they need dedicated solutions that allow them to move more efficiently despite an ever-growing roster of new customers. Scaling isn’t just about hiring new CS team members (although 73% of companies plan to do just that); it’s about learning to manage the customer experience efficiently and effectively without sacrificing the personal touch required to build customer relationships. Trend 4: Client referrals and advocacy are being under prioritized because teams have yet to make a clear shift from playing a reactive support role to playing a more proactive part in customer engagement. Customer loyalty is the ultimate measure of customer success – not just because customers don’t churn, but also because they are more likely to refer services that help drive new leads. Yet this aspect of the customer journey is the most under prioritized by today’s CS teams. Only 13% of respondents said it was their top priority, and more than twice that (30%) said it was an average-to-low priority. 40% of respondents indicate that this low prioritization is due to the fact that it’s difficult to identify potential promoters. Shockingly, despite this visibility constraint and the potential value of referrals, nearly 10% don’t plan to measure customer sentiment through NPS or CSAT at all in 2017. It’s certainly possible that advocacy takes a low priority due to the already heavy workload and small team size in most companies. However, qualitative reports frequently bring up the fact that CS teams are too reactive when they should be more proactive, making scaling success along the entire customer journey an overwhelming task. Trend 5: A more efficient technology stack will be key to helping teams understand, scale, and improve their relationships with key accounts and move toward initiatives focused on growing their customers in the years to come. It’s clear that CS teams need to trade generic communication and data-gathering tools like email and spreadsheets for tools specifically designed to provide long-term user intelligence, highly targeted engagements, comprehensive customer health metrics, and CRM integrations. The easier it is to see exactly where customers are getting stuck, to target the right communications, to prompt promoters and to capture data along the way, the easier it will be to design proactive initiatives and anticipate account-building opportunities. Technological inefficiencies and a lack of automation are causing a drag on scalability and data-gathering that desperately needs to be rectified. It’s critical that CS teams employ a solution specifically calibrated for their goals, but with only 25% of respondents indicating that they use one and 64% of CS teams having no plans to simplify their currently disjointed technology stack in 2017, there is a clear gap. As they scale, customer success teams need new alternatives to the many tools in their everyday arsenal. Thus, teams that are able to simplify and use dedicated CS software to bear the workload will be best poised to set the standard for customer success trends to come. As these trends come into practice in the coming year, customer success teams will become more efficient and effective than ever before, allowing them to reposition their efforts and have a growing impact on revenue. This shift is what we call customer growth and it will be the defining focus of customer success strategies in 2017 and beyond. The post 5 Trends that Will Shape the Customer Success Landscape in 2017 appeared first on OpenView Labs. This artical is an original countribution by Nicole Wojno.